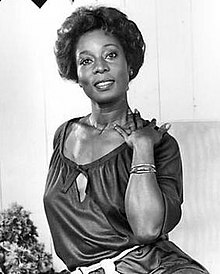 Madge Dorita Sinclair (née Walters; April 28, 1938 – December 20, 1995) was a Jamaican actress, best known for her roles in Cornbread, Earl and Me (1975), Coming to America (1988), Trapper John, M.D. (1980–1986), and the ABC TV miniseries Roots (1977). Sinclair also voiced the character of Sarabi, Mufasa's wife and Simba's mother, in the animated feature film The Lion King. Sinclair won the Primetime Emmy Award for Outstanding Supporting Actress - Drama Series for her role as Empress Josephine in Gabriel's Fire in 1991. Born Madge Dorita Walters in Kingston, Jamaica to Jamaican parents Herbert and Jemima Walters, Sinclair studied at Shortwood College for Women. After completing her studies, Sinclair worked as a teacher in Jamaica until 1966 when she left for New York to pursue her career in acting. Sinclair began acting with the New York Shakespearean Festival and at Joseph Papp's Public Theatre. Following Roots, she starred in the 1978 film Convoy as the Widow Woman, and she played Leona Hamiltons in Cornbread, Earl and Me. Sinclair received an Emmy Award nomination for her role as Belle in the miniseries Roots. Also in 1978, she co-starred in the short-lived sitcom Grandpa Goes to Washington. Sinclair went on to a long-running stint in the 1980s as nurse Ernestine Shoop on the series Trapper John, M.D. opposite Pernell Roberts. She received three Emmy nominations for her work on the show, and critic Donald Bogle praised her for "maintaining her composure and assurance no matter what the script imposed on her". In 1988, Sinclair played Queen Aoleon alongside James Earl Jones' King Jaffe Joffer in the Eddie Murphy comedy Coming to America, which reunited her on screen with her Roots husband and co-star John Amos. Later, both Sinclair and Jones would reunite as Queen and King for the roles of Sarabi, Simba’s mother, and Mufasa, Simba’s father, in the blockbuster Disney animated film The Lion King (1994), respectively. The film became one of the best-selling titles ever on home video. It would also be her last film role. The two also collaborated on the series Gabriel's Fire, which earned Sinclair an Emmy in 1991 for Best Supporting Actress in a Dramatic Series, famously beating out the expected winner, L.A. Law's Diana Muldaur. Sinclair played the role of Lally in the 1991 Channel 4 television miniseries The Orchid House (based on Phyllis Shand Allfrey's novel of the same name), directed by Horace Ové, and also received critical praise for her supporting role in the 1992 television movie Jonathan: The Boy Nobody Wanted with JoBeth Williams. In 1993, Sinclair came to London to appear on stage at the Cochrane Theatre in The Lion, by Michael Abbensetts, directed by Horace Ové for the Talawa Theatre Company. In 1994, she played a supporting role in the short-lived ABC-TV sitcom Me and the Boys, which starred Steve Harvey. Sinclair, in her brief role as the captain of the USS Saratoga in Star Trek IV: The Voyage Home, is commonly cited as the first female Starfleet starship captain to appear in Star Trek. (Joanne Linville had appeared as a Romulan commander 18 years earlier.) Years later, Sinclair played Geordi La Forge's mother, captain of the USS Hera, in Star Trek: The Next Generation's "Interface". Her final acting role was on the sitcom Dream On just one month later before her death. Sinclair was married to Royston Sinclair, a Jamaican police officer from 1956 until 1969, and had two sons with him, Garry and Wayne Sinclair. In 1982, Sinclair married actor Dean Compton, whom she was still married to at the time of her death. Sinclair died on December 20, 1995 after a 13-year battle with leukemia. Her remains were cremated and her ashes were scattered in her hometown in Jamaica. 1972 Madigan Boots Episode: "The Midtown Beat"
1974 Medical Center Arbiter Episode: "Tainted Lady"
1974 The Waltons Minnie Doze Episode: "The Visitor"
1975 Joe Forrester Sheila Gates Episode: "Stake Out"
1975 Doctors' Hospital N/A Episode: "Come at Last to Love"
1976 Executive Suite Judge Gillespie Episode: "Who Shall Hall Bring Mercy"
1977 Serpico Michelle Episode: "One Long Tomorrow"
1978 ABC Afterschool Specials Mrs. Bradsbury Episode: "The Rag Tag Champs"
1979 The White Shadow Louelia Judd Episode: "Sudden Death"
1984 ABC Afterschool Specials Miss Thomas Episode: "Backwards: The Riddle of Dyslexia"
1987 Mathnet Amelia Airliver Episode: "Problem of the Trojan Hamburger"
1987 Starman Lorraine Michaels Episode: "The Test"
1989 Gideon Oliver Angela Holmes Episode: "By the Waters of Babylon"
1989 Roseanne Muriel Johnston Episode: "Guilt by Disassociation"
1989 Midnight Caller Ida May Episode: "Take Back the Streets"
1992 L.A. Law Jessica Rollins Episode: "Diet, Diet My Darling"
1992 Tales from the Crypt Lucille Episode: "Curiosity Killed"
1993 Star Trek: The Next Generation Captain Silva La Forge Episode: "Interface"
1995 Dream On Mrs. Charles Episode: "Little Orphan Eddie"
^ Bourne, Stephen (3 January 1996). "Obituary: Madge Sinclair". The Independent. Retrieved 30 November 2018. Bogle, Donald (2001). Primetime Blues: African Americans on Network Television (First ed.). New York: Farrar, Straus and Giroux. ISBN 0-374-23720-4. This page was last edited on 16 March 2019, at 21:30 (UTC).